Anyway, you can then preview your ui elements and tweak to your heart’s delight. When you’re finally happy with the look, you can then download your theme with all the css and js code rolled up in a nice .zip file. It sure is handy and a lot faster than combing through all that css in Textmate. So, in this post, you’re going to learn how to integrate jQuery ui into your Ruby on Rails application. It can be a bit tricky at first, since the instructions you get with jQuery ui are not Rails-specific. So listen up! Grab a Redbull or throw a couple stiff espressos down your gullet, sit back and hark unto me, your faithful Rails Developer, as I take you by your soft little developer hand and teach you everything you need to know to get your Rails app” jQuery-ui-ified”. 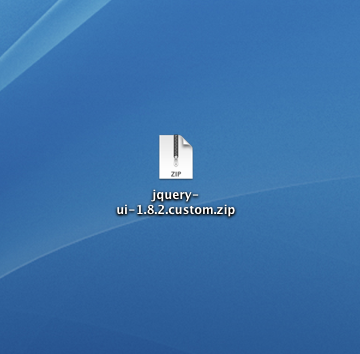 I assume you have jQuery installed already. If not, it’s your first step. Obviously. Here’s how to get it into your app. Head over to jQuery. Right on the homepage is a link to the downloads. 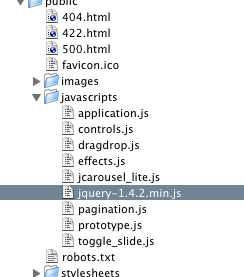 I recommend the latest minified version of jQuery, unless you plan to mess with its innards. Once that’s done, link to it from your application layout file (or whatever layout you’re using). 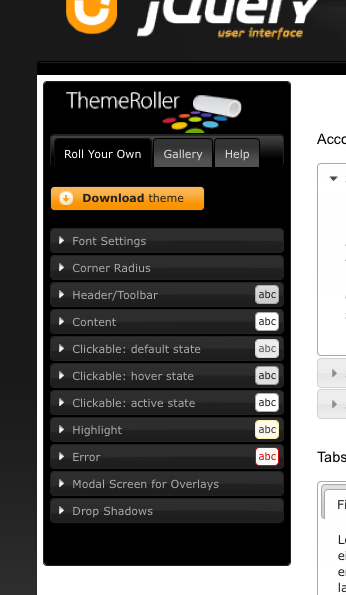 Grab a theme you like from the jQuery themeroller page. Click on the “Gallery tab” to preview different themes. I’m going to grab a really ugly theme for the purposes of this post. It’s called “blackness”. Hey wait a second. Are you still with me? You gotta pay attention here: Grab another Red Bull. I’ll wait. You all set? Good. Back to brain expansion. 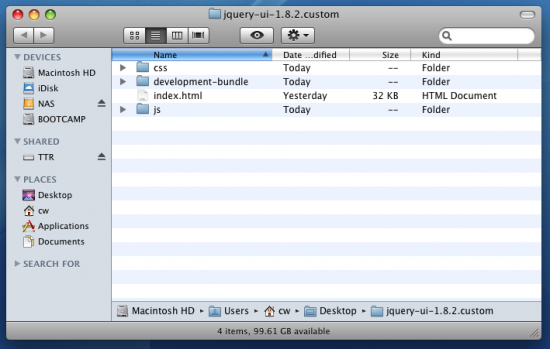 Next, reference this file in your application layout file: after your jquery link. (I’m leaving file extensions on the files we included to set them apart from other css and js files). O.K., now it’s time to get the CSS into your app. Open the CSS folder that was inside that zip. It contains another folder named for your custom theme. 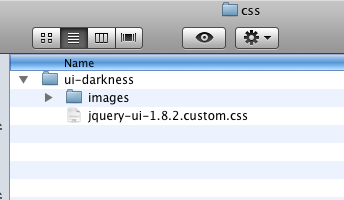 In my case, it’s named “ui-darkness”. 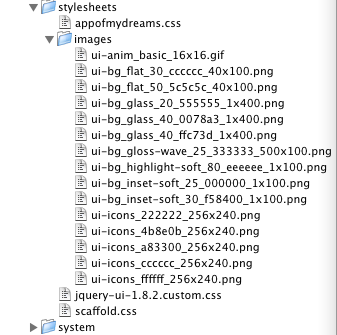 Inside of that you’ll find an images folder as well as the custom css file. 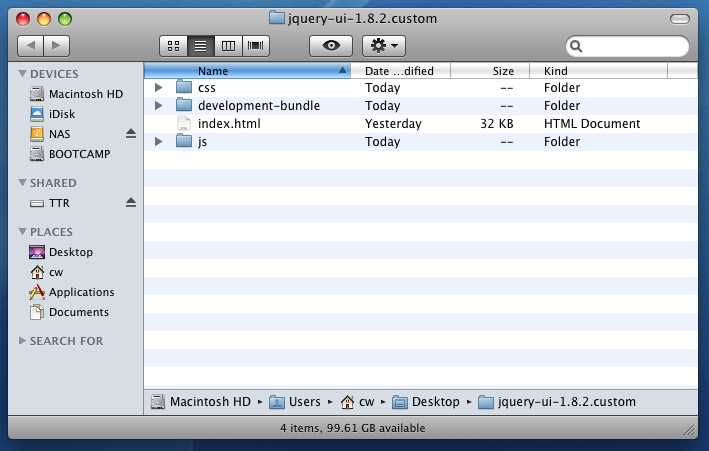 Stick the custom css file (“jquery-ui-1.8.2.custom.css”) into your good ‘ole public/stylesheets folder. O.K. We’re almost done. Here’s the last step: creating the html that interacts with our jQuery js and css. jQuery UI makes this part brain-dead simple. .
Nice! Our skeletal HTML is now styled and the jQuery tabs look great (at least if you’re in a Halloween mood). But the point is, they work. Which is a lot more than you could say before you read this post. This happens a lot in WordPress themes you purchase, too. How do you get rid of that? BAM! Now our tab looks normal in Firefox after clicking it. No more dashed borders. Cause I didn’t want you to get this far and be stuck with a bunch of crappy outlines around your beautiful jQuery tabs. You know why not? Cause I’m a nice guy. And YOU are a more empowered programmer. A geek to take on the world. A coder on a crusade. Now get some sleep. It’s way past your bedtime. See you next post. well tnx really, i look over for this too much and this was the only page that i found that really explained it well. and your writing style… ehmmm… lets say that i didn’t fall asleep. unfortunately after that many redbulls I just wasn’t able to go to sleep as suggested. LOL – Glad it helped. Great! Worked in 5 (five!) minutes, now all seems so professional! Wow, a year later and still a success (and still in the 21st century). Thanks for the clear guide! Thank you so much for a clear n good explanation. Great tutorial! Very succinct, informative, well written! It only comes with the base theme (Smoothness) so far though. I’m thinking this might change once the jQuery UI build system is updated (in 1.8.19 perhaps), but for now if you want other themes, you still have to go the download route. 5AM now… way past my bedtime? NOTE for Rails 3.2.5 users. 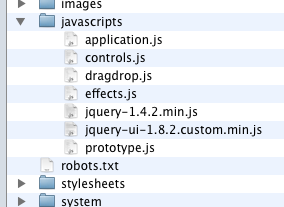 I had to place the jQuery files in a different directory in order for it to work.